Standard - $33.99 Only 1 left! No matter when you grew up, we bet you loved Minnie Mouse. She’s as classic and timeless as Mickey Mouse, but manages to have her own style and mirth that makes it impossible not to just love her. Totally unlike that Pete guy! In fact, how can anyone find anything redeemable about Disney cats!? This cartoon sweetheart loves to sing and dance, and always steps out in impeccable style. Sweet and cheery, she's nothing like those villainous felines out there! 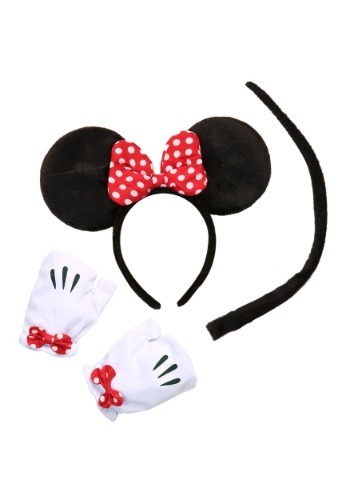 Enjoy showing off your sweet side with this Minne Mouse Tail Accessory Kit. You’ll have a complete look even if you don’t have hours to put your costume together thanks to all the parts you need to recreate Disney’s iconic character! Of course, polka dots are part of her signature look, and they’re featured on the bows on her head and gloves. Normally, you wouldn't want to attract a bunch of rodents, we suppose, but when they're as adorable as the Disney mouse clan, it's probably a different story. Make Mickey swoon when he sees you in this Minne Mouse kit and show all those Disney Princesses who is the Disney Queen.